These are the hands of an artist. Art is definitely personal, but when I look around in the Kada Gallery, I can't imagine anyone not finding beauty in the creatures that stand before me. On the lower floor, 20th century replicas of the exquisite animals one would find on a grand carousel surround me. One can almost hear the organ music that plays under the lights of a merry-go-round and can experience the nostalgia of a childhood trip to the amusement park. Each piece is majestic in its own right, and as I inspect the intricate detailing, I can't even begin to fathom the time and energy that went into creating these sculptures. But I quickly learn that the man behind the magic – 83-year-old artist John DeAngelo – only brought them to life a little over 20 years ago. "Before my 20th wedding anniversary, I mentioned to my husband that I would love to have a carousel horse," says Kathy DeAngelo, John's sister in-law and co-owner of the gallery. "Unbeknownst to me of course, he ended up talking to John (his brother) and asking him if he would be willing to create one, which he ultimately did, and when I found out, I had mentioned he was going to have to give the first one to his wife, and he says, 'what makes you think I'm going to carve another one? So, I told him, 'I know you, John.' You're probably going to carve an entire carousel." And he's well on his way. To date, he has carved seven creatures, including a jackrabbit and a lion – but this is only a very small part of the art he has created over the years. "I started creating these horses back in 1991," John tells me. "Prior to that, I was creating small hummingbirds out of wood, so you can imagine the transition from a small ruby-throated hummingbird to a large carousel horse." John's creatures are almost exact replicas of previous carousel models that were built before the turn of the century. "I pattern many of these animals off of sculptors that were around in the early 1900s," John says. "I used to belong to the American Carousel Society, and they would publish photographs of many of the horses. If I saw one I liked, I mainly worked from a photograph. The dimensions are only slightly smaller than the originals." And these are all hand-carved creatures. "I create everything piece by piece using a chisel. I do everything – cutting the wood, making the shapes, carving the body, legs, and tail. It's all done piece by piece. The smaller works take around six to seven weeks, but the bigger pieces I've created I'll generally start after Thanksgiving and bring them home after Easter." In fact, each of his projects is paired with a photo album documenting the entire process. "Each work has come with its own set of challenges. It's rewarding to see the process from inception to completion – starting from the initial sketches to the finished product," he says. I quickly learn that prior to this chapter of his life, most of his career was spent in the finish carpentry and furniture-making business that was Lake Shore Pattern Works in Erie. Although he started as an apprentice, John eventually worked his way up to owner before retiring 15 years ago. "During the time I was at Lake Shore, we were involved with making sculptured clay heads and casting them in metal. I've made hundreds of clay heads of famous people. Everyone from former Pennsylvania Gov. Tom Ridge to William Wrigley, Jr. (the chewing gum magnate and former owner of the Chicago Cubs). Art has always in some way been a part of my daily life – both within and outside my profession." Although John is now retired, the sculptures he created outside of work were never to be sold. "These are all labors of love. I enjoy creating them. Nothing is for sale, and after the show, I'll haul them back home. Later, I'll pass them down to friends and relatives and I won't make a nickel on them, but that's the way I want it." There is one piece, however, he'd like to see on Erie's waterfront. In Kada Gallery, one will notice a cheery, welcoming mermaid aptly named "Erieanna." I find out she was created in dedication to the giving spirit that John believes is all throughout our community. "I would love to see her cast in bronze and placed at the end of the pier," he explains. "There is a message placed on her that tells the viewer that the piece is dedicated to the people of Erie. The way I see it, Erie welcomes all kinds of people. Everyone is so generous with their time, talents, and resources. And I'm recognizing them through this," he continues, humbly adding, "in a very small way I'm sure." I then asked him what inspired him to take this path in life. "I lived near St. Patrick's church growing up. Every morning, this lovely older lady would pass by me on her way to church. She was always dressed in black because she had lost her husband, and back during that time, after that loss, women would dress in black forever. She always said hello as she was walking, but one time she came over and took me by the hand. She looked down at the points on my fingers, grabbed the other hand and said, 'Those are the hands of an artist.' This stuck with me always. Even today I think about it. And I believe it was her words that really inspired me to do what I do today." 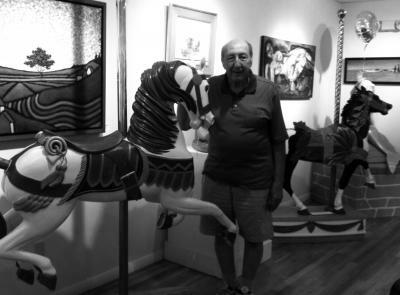 The "Art of the Carousel," a retrospective exhibition of woodcarvings, is currently on display at the Kada Gallery, located at 2632 W. Eighth St. in the Colony plaza. For more information, call 835.5232.